Your local GetSet team brings high quality professional resources to your business, providing invaluable commercial insights, knowledge, and flexible, practical support, and a wealth of first hand experience to help grow your bottom line. This GetSet for Growth service is part of the Enterprising West of England programme and the support is available to you in the West of England, thanks to funding from the European Regional Development Fund. Our West of England ‘GetSet for Goals’ football team competing in aid of the ‘Well Beans’ initiative. 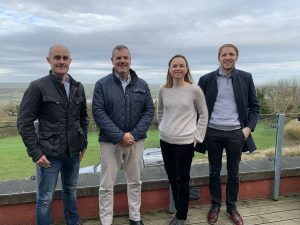 Made up of finance, marketing and sales experts, the GetSet for Growth team is dedicated to offering their support and expertise to SMEs across the West of England, thanks to the European Regional Development Fund. Read about their expertise below, or contact us to find out more. Philip is an accredited Project Manager who over the past 5 years has delivered £4m of public sector programmes to support small businesses in the construction and sustainability sectors. Working across national and international remits, Philip has led projects to engage with over 140,000 SMEs, helping them develop the skills and market awareness to deliver the UK’s green agenda. He understands the needs of small businesses better than most and in 2013 delivered a series of 150 breakfast and after-work presentations so that the working day remained interrupted. Along the way Philip has gained recognition as a leading spokesperson on the sustainability marketplace and has acted as a Government advisor on environmental policy development. As a result he maintains seats on the Green Construction Board, Supply Chain Insight Group and Household Energy 2020 Strategy group. Bristol born and raised, Philip maintains a keen interest in the area and has even held a season ticket at Ashton Gate, the home of Bristol City Football Club. Jenny is a Chartered Management Accountant who has worked with both large and small corporations. She started out with global food producer Kerry Group and more recently has worked with a variety of SMEs as well as setting up and selling her own company in the leisure industry. In her role as Senior Finance Advisor, Jenny works with the GetSet for Growth team bringing her experience of finance in a practical way. Jenny enjoys making finance helpful, understandable and useful. She has a passion to show people that accountancy is not boring and can be incredibly valuable in growing businesses. When not working, Jenny can be found chasing her children around Clevedon Marine Lake or swing dancing in Bristol. Sian joins the team with a rare combination of strategic business insight, entrepreneurial mindset and creative flair from a large entrepreneurial education group. After a senior learning and development trainer role, she took on a role as a start-up advisory consultant, which progressed to chief operating officer in a global educational technology start up, helping to build a business from scratch. Sian has a wealth of experience helping SME’s accelerate growth. A tech savvy problem solver, Sian is passionate about delivering tangible results. Quick to embrace digital marketing tools she is quickly able to understand clients’ markets, products and channels, segmentation in the most complex value chains, sales cycles and competitive contexts. In her spare time Sian is an autodidact and is an advocate for female and BME entrepreneurship and enjoys keeping active through long distance running, cycling and semi-professional Lindy Hop. Ann joins GetSet for Growth from a previous role within YTKO Group’s NEA Wessex project, a government scheme helping unemployed individuals into self-employment. As Project Administrator, Ann supported and coordinated seven business advisors and was a key liaison with the Department of Work and Pensions. Ann has a financial background and spent several years at HSBC, firstly in a role organising security for loans and mortgages and then as a Personal Assistant role in their Bristol Cheque Clearing Centre, where she was responsible for HR and administration. Ann also spent two years as a Personal Advisor with JobCentre Plus, a challenging role helping the long-term unemployed into work during a period of high unemployment. Outside of work, Ann has been a school governor for some twenty years, including ten years as Chair of the governing body, and is also the Chair of the school’s finance, staffing and pay committee. This GetSet for Growth service is part of the Enterprising West of England programme, which has been commissioned by the Department of Communities and Local Government (DCLG) aimed at supporting Small to Medium Size Enterprises (SMEs) to support business growth.